Welcome to National Disability Employment Awareness Month! We are excited to have a whole month to share stories from around the country about employment and how we can all work to achieve our goal of 6 million people with disabilities participating in the labor force by 2015. This year’s theme is “Expect. Employ. Empower.” Look for stories on this blog and using the #6by15 on social media about how the Six by ’15 campaign and partners around the country are promoting disability employment, especially our new Do This in Your State series, which includes replicable ideas for how to move forward on the goals. 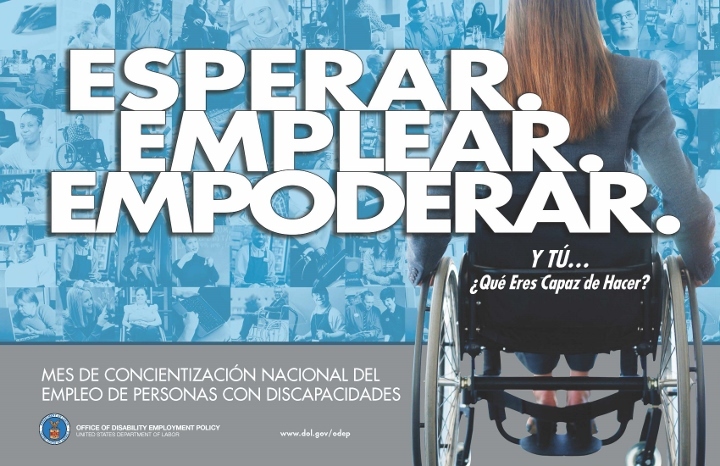 Our posts this month will feature the official poster in English and Spanish.